These Duelists didn’t quite make it to the glory of a title, but that’s not so bad. They’re both already YCS winners! Galo Orbea won YCS Ecuador in 2011, while Andrew Fredella took YCS Orlando in 2005. The winner of this FIRE versus WATER battle will be taking home a Super Rare copy of Digvorzhak, King of Heavy Industry! Orbea Set two back row cards. Fredella had Mermail Abysslinde, 2 Atlantean Dragoons, 2 Mermail Abyssteus, and Mystical Space Typhoon. He discarded Dragoons for Abyssteus, searching out both Deep Sea Diva and Mermail Abyssgunde with their effects. He Normal Summoned Diva, and Special Summoned Atlantean Marksman. Marksman attacked into Dimensional Prison, then Abyssteus and Diva attacked directly. Fredella Set Mystical Space Typhoon. Orbea Normal Summoned Gene-Warped Warwolf. 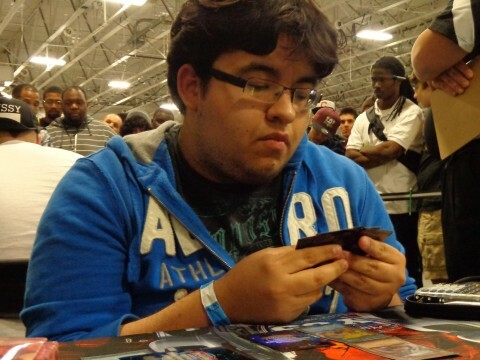 It destroyed Abyssteus in battle, then he Set a second and third back row card. Fredella drew Dark Hole. Once again he discarded Dragoons for Abyssteus, searching out Diva and Mermail Abysspike. He played the Diva to bring out Marksman. Next, he stacked both Divas for Gachi Gachi Gantetsu, but lost it to Solemn Judgment. Orbea sent Warwolf to destroy Marksman. Fredella still had 7100, but Orbea had only 3050. He Set two more back row cards, now with four. Fredella drew Mermail Abyssmegalo. He Normal Summoned Abysslinde, turned Abyssteus to defense position, and crashed Abysslinde into Warwolf. Its effect brought Mermail Abyssleed to the field, but it Orbea used Forbidden Lance to win when it attacked. Orbea Set Torrential Tribute, losing it to Fredella’s Mystical Space Typhoon in the End Phase. Fredella drew Abyss-sphere. He played Abysspike, discarding Abyssgunde to search out Marksman. Abyssgunde revived Abyssleed. Fredella Tributed Abysspike to take Mystical Space Typhoon from Orbea’s hand, but lost Abyssleed to another Forbidden Lance Battle Phase trick! Fredella Set Abyss-sphere. Orbea played Pot of Duality, revealing another Pot of Duality, Brotherhood of the Fire Fist – Gorilla, and Fire Formation – Tenki. He took Tenki, searched out Brotherhood of the Fire Fist - Bear with it, and Summoned Bear. Bear’s effect used up Tenki to take out Abyssteus. Bear attacked directly, Fredella got Abysslinde with Abyss-sphere, but Orbea had Bottomless Trap Hole! Bear struck directly to search out Tenki, then Warwolf hit directly. Fredella drew Drastic Drop Off. Dark Hole sucked up Orbea’s monsters, and Fredella played out Marksman. It attacked directly, brought out Dragoons, and Dragoons ended the first Duel! Galo Orbea plays a valiant game of “Protect the Warwolf” but it just isn’t enough in the end. 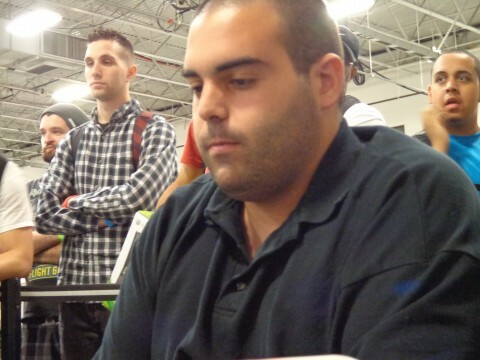 Andrew Fredella is one win away from a Super Rare Digvorzhak, King of Heavy Industry! Orbea used Pot of Duality to reveal Pot of Duality, Soul Taker, and Solemn Judgment. He pondered his options a while, and took the other Pot of Duality. He played Tenki to add Reborn Tengu to his hand, and Summoned it. Finally, he Set a back row card. Fredella started this time with 2 Bottomless Trap Holes, Solemn Warning, Abyssgunde, Diva, and Marksman. Diva brought Atlantean Heavy Infantry to the field, and Fredella played Marksman alongside it. He Xyz Summoned Gachi Gachi Gantetsu and Set all of his traps. Orbea played Gene-Warped Warwolf into Fredella’s Bottomless Trap Hole. He used Pot of Duality next, revealing Soul Taker, Mirror Force, and Gene-Warped Warwolf. He chose Mirror Force, then Set three spells or traps. Fredella drew Mermail Abysspike. He Normal Summoned Abyssgunde, and stacked it with Marksman for Wind-Up Zenmaines in defense position. Orbea played Rescue Rabbit, but when it brought out the 2 Gene-Warped Warwolves, they were banished by Bottomless Trap Hole. Fredella drew Salvage and passed. Orbea Set a fourth face-down back row card. With Tenki also out, his Spell & Trap Card Zone was full. Fredella drew Mermail Abyssteus and passed. Fredella drew Dimensional Prison and passed. Orbea played Brotherhood of the Fire Fist - Bear. It pitched Tenki to target Gachi Gachi Gantetsu, then Orbea negated Gachi Gachi with Fiendish Chain! No longer able to protect itself, Gachi Gachi went down. Orbea stacked Bear with Reborn Tengu for Brotherhood of the Fire Fist – Tiger King, but Fredella negated the Summon with Solemn Warning. That was the first change in Life Points this Duel. Orbea Set a back row card and played Dimensional Fissure. Fredella drew Mystical Space Typhoon. He Set Prison, losing it to Orbea’s Typhoon. Orbea played Banisher of the Radiance. Fredella drew Mermail Abysslinde. He Summoned Abysspike and attacked Banisher, but lost to Mirror Force. Fredella drew Deep Sea Diva. That let him Special Summon Marksman, and he Synchro Summoned Ally of Justice Catastor. Catastor attacked, and Banisher was destroyed. Orbea Set a back row card. Fredella drew Atlantean Heavy Infantry. Catastor attacked directly, but was sent flying by Compulsory Evacuation Device. Fredella drew Marksman. He used Mystical Space Typhoon to destroy Dimensional Fissure, then he discarded Marksman for Abyssteus. Marksman destroyed the face-down Rescue Rabbit, and Abyssteus searched out Abysspike. Fredella used Salvage next, adding Diva and Marksman to his hand. He Normal Summoned Abysspike, discarding Marksman for its effect. He searched out Mermail Abysslinde. Marksman targeted a face-down card, but Orbea used it in response: Fiendish Chain, targeting Zenmaines. Abyssteus and Abysspike attacked directly. Orbea used Dark Hole to wipe the field! He had two cards left in his hand, and one face-down spell or trap. He Normal Summoned Reborn Tengu, attacking directly with it. Fredella drew his own Dark Hole. He played Abysslinde and sent it to attack Tengu. When it went down, it brought Mermail Abyssleed from the Deck to destroy Tengu. Orbea Set a back row card and played Banisher of the Radiance. Fredella drew Abyss-sphere. Abyssleed destroyed Banisher, then Fredella Set Abysslinde and Abyss-sphere. He lost Abyss-sphere to Mystical Space Typhoon in the End Phase. Orbea Set a spell or trap. Fredella drew Mystical Space Typhoon and used it on the new face-down, Dimensional Fissure. He Flip Summoned Abysslinde and attacked, and Orbea revealed his other Set card, another useless Dimensional Fissure! Andrew Fredella takes third place, and a Super Rare copy of Digvorzhak, King of Heavy Industry!